The Best Gas Powered Roof Cleaning Pump System Around! The Roofster is an exceptional pump skid system made expressly to pump extra strong chlorine and other corrosive chemicals. The Roofster is exclusively sold by Sun Brite Supply. This is a chlorine-proof pump driven by a Honda gas powered engine and mounted on a skid frame. It has an incredibly small footprint measuring approximately 25" long, by 16" wide and 15" tall. This is the only gas-powered system designed to stand up to highly corrosive products like bleach. When coupled with a Bleach rated gun, this unit will shoot Sodium Hypochlorite about 45' at 9 Gallons Per Minute! This makes it the ideal tool for cleaning roofs and other soft-wash functions. You can count on the ROOFSTER to provide reliable operation without cracking Manifolds like some of the other systems built with Udor Zeta Pumps. This pump, which we consider "bleach-proof", is constructed with polypropylene and chemical-resistant stainless materials. The pump skid includes a gear-reduction transmission to run the pump at lower RPM's, so the pump has exceptional durability. This pump will give you the longevity that electric pumps just cannot deliver. With reasonable care, the pump should hold up for several years before requiring maintenance. Since this is a low-pressure system, you can also add a downstream injector to your Roofster. This allows you to add soap to the stream of bleach without pre-mixing them. This will limit the "throw distance" of your Roofster, however. The factory rates this pump system at 9.6 GPM, but our test model delivered a consistent 9 GPM with our gas engine. 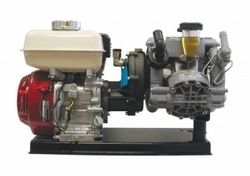 The skid unit includes a regulator that limits the overall delivery force to 150 PSI. This Bleach Pump was run-tested for months without any problems whatsoever - and the cost of this rig is lower than any comparable set-up we have seen! Using strong bleach is a favorite way to clean mold and algae off roofs and other surfaces too steep to walk on. Spraying strong sodium hypochlorite kills the mold fast. Problem is, this is such a corrosive chemical that it also attacks the equipment used to spray it. This is the most economical answer we could develop to deal with those sorts of corrosive chemicals. We achieved streams of over 40 feet consistently at approximately 9 GPM during our testing process. The new Roofster system comes as a Kit that includes a Honda Gas engine, the Diaphragm Pump System, an unloader and a gear reduction system all mounted on a skid, so you can easily build your own custom system using your tank and reel. Or of your on a budget, you can just use an empty 55 Gallon container and 3/4" hose. Please keep in mind that a Roofster is made-to-order and can take a few business days to produce. Roof Kleen The Original Roof Cleaning Detergent Removes Black Streaks From Roofs Bleach Friendly!